Democrat Cory Booker has won a special election to represent New Jersey in the U.S. Senate through next year, but the rising political star will have to return to the campaign trail almost immediately to run for a full term. Booker, 44, defeated conservative Steve Lonegan on Wednesday after an aggressive two month race to finish the term of Sen. Frank Lautenberg, who died in office in June at age 89. The Newark mayor takes to Washington a national profile — boosted by a strong social media presence, frequent television appearances and his status as an Obama surrogate during the president's 2012 re-election campaign — just as the federal government begins functioning again after a 16-day shutdown. "That's why I'm going to Washington — to take back that sense of pride," Booker said in his victory speech. "Not to play shallow politics that's used to attack and divide but to engage in the kind of hard, humble service that reaches out to others." Booker, a supporter of gay marriage in a state where the issue is the subject of a court and legislative battle, talked about needing to improve America's schools and making the Senate "more accessible to all of us." "If you voted for me, I will make you proud," he said. "If you didn't vote for me I will work every single day to earn your trust." 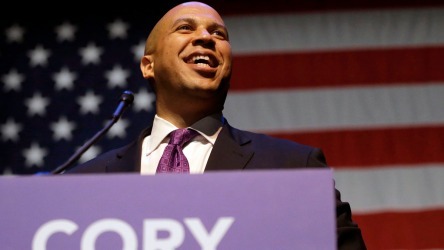 Booker, who has begun raising money to run for a full six-year term, would be on the ballot again in November 2014. Lonegan, 57, told The Associated Press he has no plans to run again or return to Americans for Prosperity, the conservative, anti-tax group he quit to enter the race. He said he intends to start a business. A feisty campaigner who unsuccessfully challenged Chris Christie for the Republican nomination for governor in 2009, Lonegan brought this race closer than many expected in a state that leans Democratic. With nearly all precincts reporting, Booker had 55 percent of the vote to Lonegan's 44 percent. The first reaction from the social-media savvy victor came, of course, on Twitter: "Thank you so much, New Jersey, I'm proud to be your Senator-elect." Booker, who will soon be sworn in as the first black senator from New Jersey, will arrive in Washington from the state's largest city with an unusual political resume. He was raised in suburban Harington Park as the son of two of the first black IBM executives, graduated from Stanford and law school at Yale with a stint in between as a Rhodes Scholar before moving to one of Newark's toughest neighborhoods with the intent of doing good. He's been an unconventional politician, a vegetarian with a Twitter following of 1.4 million — or five times the population of the city he governs. With state funding dwindling, he has used private fundraising, including a $100 million pledge from Facebook founder Mark Zuckerberg, to run programs in Newark, a strategy that has brought him both fame and criticism. Former state Attorney General Jeffrey Chiesa had been appointed by Christie to temporarily replace Lautenberg. The governor scheduled the special election for just 20 days before Christie himself is on the ballot seeking re-election. Democrats said Christie was afraid of appearing on the same ballot as the popular Booker, but courts upheld the election schedule. Before Lautenberg died, Booker passed up a chance to run against Christie this year, saying he was eyeing Lautenberg's seat in 2014, in part so he could complete a full term as mayor — something he won't do now. Booker does not expect to be sworn in until close to the end of the month, an aide said, noting the results still need to be certified by the state. Newark's council will be able to appoint an interim mayor when he steps down.